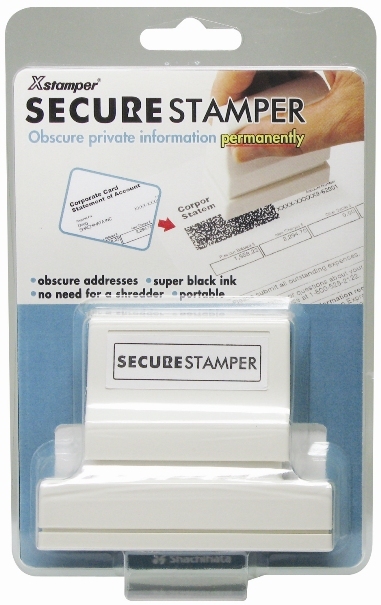 Secure Stamp - Impression Size: 15/16" x 2-13/16"
Protect yourself with the Xstamper Secure Stamp. The special black ink obscures private information. Perfect for hiding personal information on mail and packages, also useful for prescription bottles, price tags on gifts and sensitive documents. Covered information can't be easily read, scanned or copied. Works best on printed black ink. Packed in pegable clam shell. This stamp is refillable see below to add a bottle of ink to your order. Re-Inking Instructions: Remove top and place 3 to 4 drops of ink into the openings of the stamp. Would You Like to Purchase a Bottle of Refill Ink?